Underground Winemakers was established in 2006 at Mt Eliza by former T�Gallant employees, Adrian Hennessy, Peter Stebbing, and Jonothan Stephens. At that time the venture had no resources other than a collective wine industry experience of over 30 years and a resourceful, hands on determination. The vision was simple; source the right grapes and make quality, approachable wines which are true to style and expressive of variety. Underground take pride in their hands on approarch to vitticulture and winemaking, offering a range of individual, expressive wines which are true to variety and an honest reflection of the land. 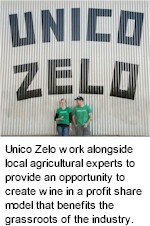 Being winemakers, Unico Zelo are people who are incredibly passionate about the soil and produce in Australia. It's their contention to showcase products to the rest of the world that embrace Australian native ingredients and pay homage to the custodianship of the indigenous people who maintained the land for thousands of years. Great wines made in styles that are typified by the life and culture of this sunburnt country, from grape varieties that require minimal intervention. It's this passion that has driven Unico Zelo to start two wine labels, one that protects farmers and another that protects the future. They've since taken these concepts, alongside their Applewood Distillery, and catapulted them into the horticultural realm, studying indigenous produce, it's beneficial effects on the land and the stories it can tell through incredible colours, flavours and textures.